Time for a New Positioning Slogan? This fitness center needs your advice. They are starting to think that their positioning slogan is primarily responsible for their loss of new customers/members. Do you think it’s time for a new slogan? In the following table you are presented with examples of positioning slogans gone wrong. However, at the essence of each is a good positioning concept, it is just that the words have been poorly constructed. For this exercise, you are required to determine the positioning goals associated with various positioning slogans. In the table below you will see a number ‘well-known’ positioning slogans. 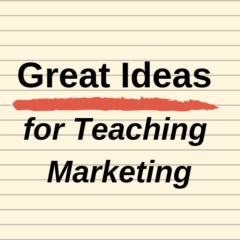 For each one, outline what you believe the slogan means and what it is trying to communicate. 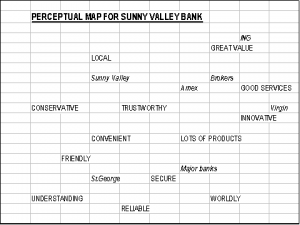 In this activity you need to read and interpret a perceptual map. 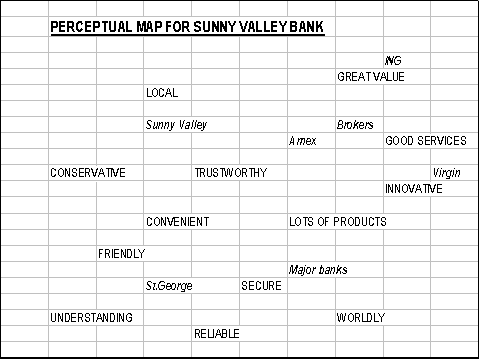 Shown below is a perceptual map for Sunny Valley Bank (a hypothetical example only). You need to determine what it tells you about the current positioning of the bank and what challenges they may face.